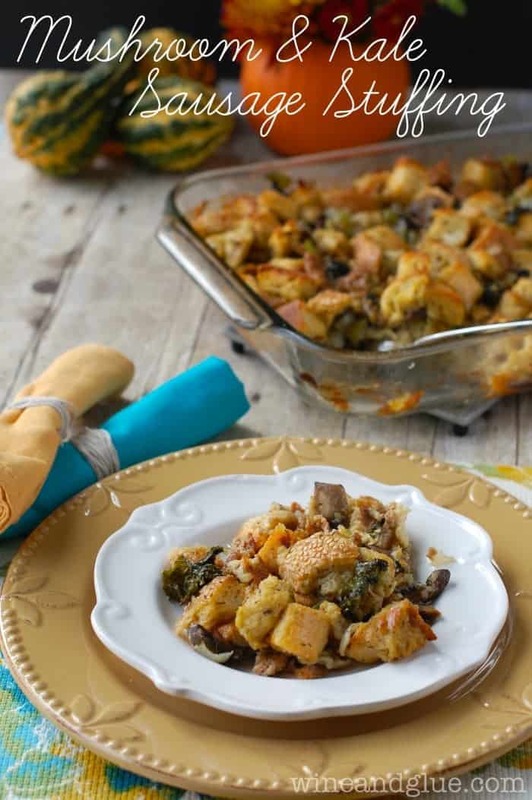 Mushroom & Kale Sausage Stuffing | Delicious stuffing that is easy to change up to make with your favorite ingredients. Put down the can of soup and step away. You can’t throw it at my head. And not just because I’m not actually in the same room with you, but also because we are alllllllmost to November, so it’s like totally absolutely time to start thinking about our Thanksgiving menus. 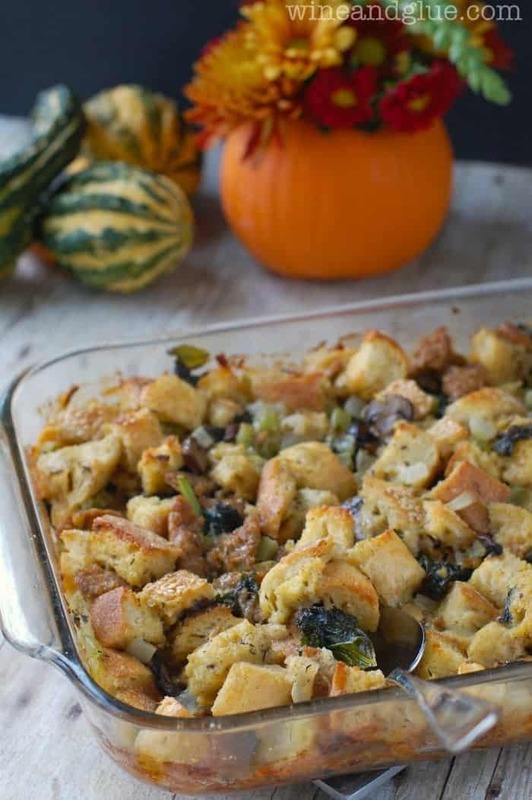 Lets talk about stuffing, shall we? I looooooooooooove stuffing. Like I want to take it out and pick out china with it. I want to mini stuffing babies with stuffing. Annnnnyway. Stuffing! 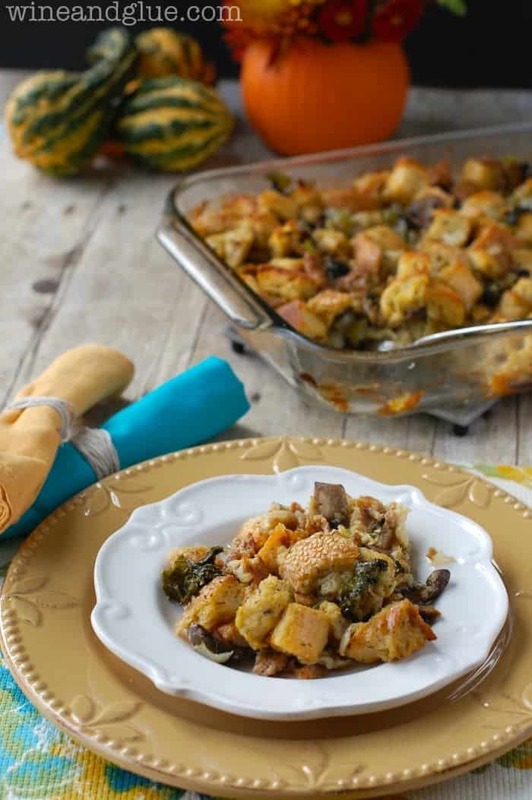 One of the great things about stuffing is that you can do so many different things with it. The traditional stuffing has regular sausage and some apples. But you can always replace that sausage with something less traditional like I did here with Hot Italian Sausage. The roots of this recipe come from Food Network Magazines November 2011 issue. They did this great piece on how to make stuffing in different ways. What it comes down to is picking your bread (Selmonia here), a standard base (butter, celery, onions, stock, spices), eggs, mix-ins (mushrooms and kale here), meat (Hot Italian Sausage here), and more mix-ins (cheese here, but it could be fruit or nuts). If your bread isn’t stale, you can cut it up and leave it sit out overnight or throw it in a 300 degree oven for 20 minutes. Preheat your oven to 375 and spray a 4 quart baking dish (16 by 11) with cooking spray. In a large saucepan, melt your butter. Add the onions and celery and cook until soft and translucent. Add your thyme and sage and season with salt and pepper. Add the chicken stock, and bring to a simmer. Remove from the heat. In a seperate pan, cook the turkey sausage. Once fully cooked, remove from the pan and set aside. Spray the same pan you cooked the sausage in with cooking spray and cook the mushrooms, about four minutes, until softened. At the very end, toss in the kale and let it wilt. Remove from the heat. In a large bowl, beat the eggs, add the bread, stir to combine. Stir in the broth mixture, the kale, the mushrooms, the sausage, and the cheese. Pour the whole mixture into your baking dish. Cover in foil and bake for 30 minutes. Uncover and bake for an additional 20 minutes. I LOVE stuffing! It’s never too early for stuffing. I read that same article about the basic stuffing recipe! The difference between you and me…you make something. Yeah you! 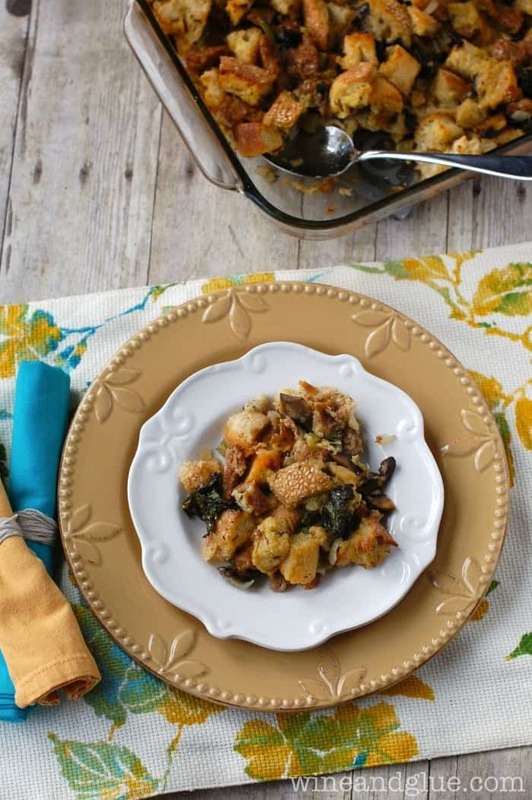 I love the combo of mushroom, kale and sausage…sounds delish! Gorgeous photos! And this sounds amazing. I loooove stuffing too! Even with our Canadian Thanksgiving having already passed, I can see me getting a ton of use out of this seasonal recipe. Thanks for sharing! I’m already looking ahead to some delicious Thanksgiving recipes – this will be at the top of my list. I love the holiday and the stuffing is a BIG reason why. This looks fantastic! Can I make this the night before and just cook in the oven on Thanksgiving? Funny you should ask that Liz, I’m just now developing a recipe for make ahead stuffing 🙂 Yeah, you should be able to make it ahead, just make sure your bread is really stale, and bring it to room temperature before baking. Can I ask what is a stick of butter?